How Well Do You Know Your Customer’s Customer? How would you answer that question with regard to your biggest account? I’d suspect you’d say you know a pretty good amount. Now, ask that same question about the prospect you’re about to call on? Different answer? Why? Don’t tell me it doesn’t matter because they’re only a prospect. I’ll argue it does matter because they are a prospect. Put yourself in the shoes of the customer, why would you as a salesperson have to say make any difference? 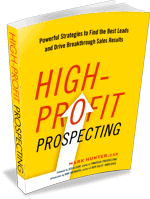 Most customers say all salespeople are alike, especially when they’re prospecting. Now think about how much differently your prospect is going to think of you if you can share with them insights about their customers? When we share with prospects insights about their customers, it demonstrates several things. First, it shows we’ve taken the time to understand their business. Second, it allows the discussion to be on topics other salespeople would never be able to have. Third, it allows you to stand apart. Sales leaders are always asking me what is the value of having salespeople focusing on select industries versus just getting whatever business they can. I see the biggest difference is it allows the salesperson to develop industry expertise, especially with regard to understanding the customer’s customer. The ability to share a critical insight at just the right time is many times what allows a business relationship to take hold. When I’m working with sales organizations, a key aspect I focus on is questioning the sales team about what they know about their customer’s customer. I follow that up with then asking how they use it in conversations with customers. Regardless of what they know or don’t know, I find it always opens up eyes to seeing what the potential is when it comes to knowing that level of information. Your goal should be to be seen by not only your customers, but also by your prospects as someone who knows as much or even more about their customers as they know. PrevPreviousSales Motivation Video: Who Are Your MASTERMIND Peers?